This is a traditional Japanese seven-spice blended mixture of red peppers, sansho pepper, roasted orange peel, black and white sesame seeds, seaweed, and ginger. Found in noodle shops throughout Japan, much like you'd find salt and pepper on every table. 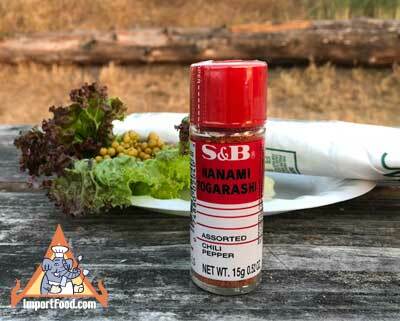 A sprinkle or two of this spice mixture brings out the flavors of Japanese food, and is usually used in noodle soups such as udon, soba, beef tataki, or other dishes (see below for a fusion favorite!). Sprinkle a bit over jasmine rice to flavor it. We recently enjoyed it with Udon soup, see recipe link below. We added a piece of barbecued fish to the soup and served it with beer, for a delicious combination. It's a complement to any noodle dish--a very useful spice to have. Ingredients: chili pepper, orange peel, black sesame seed, white sesame seed, Japanese pepper, ginger, seaweed. Product of Japan. Our customer Marylyn sent us this email: "I live in Houston, TX and this city has a very large and diverse asian community with vast asian markets, but believe it or not, as big as the markets are here, I have a very hard time finding a specific item. So I decided to search the internet for NANAMI Togarashi and found 2 websites that I considered purchasing from . After adding the same quantity to my cart from both sites, I found that your site has a more reasonable shipping charge and decided to proceed with the checkout after adding a few other different items (The other website is a MAJOR shopping site that starts with an "A"). My order came in promptly and with more-than-Excellent packaging! I'm so glad to have found your site and you'll definately be seeing more of me!"